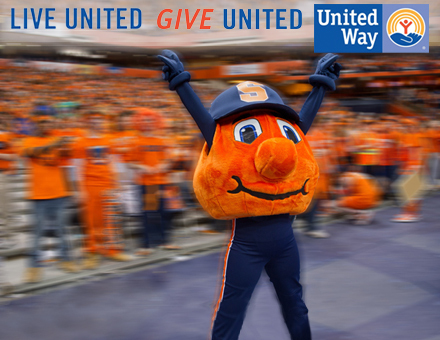 All members of the University community are invited to join the Syracuse University United Way committee, and Otto, Thursday, Oct. 16, from 2:30-4 p.m. in the atrium of the Schine Student Center for a food and photo campaign kickoff celebration. Staff who bring their completed United Way pledge card or make a donation to the United Way at the event will receive free desserts donated by Campus Catering, and will get a free photo with Otto. Pledge cards will be available at the event. The University has held a United Way campaign on campus each fall for more than 40 years. The organization is the only nonprofit the University partners with as “one University,” with payroll deduction as an option for giving. The dollars contributed to the United Way stay local—supporting 34 nonprofit agencies and 91 local programs. In the last 10 years, Syracuse University employees have contributed more than $1.5 million dollars to the United Way, and each of those years it has ranked among the top 20 employee campaigns in Central New York. Campaigns held in 2012 and 2013 earned the University a ranking of seventh place in overall giving among Central New York institutions. A pledge card, with a message from Chancellor Syverud and Dr. Ruth Chen, was mailed to all employees this week. And an e-Pledge solicitation— a secure paperless giving option—will be emailed to all staff each Wednesday through Nov. 5. Employees who give for the first time, or who raise their gift by a dollar per week, are automatically entered into the United Way’s Step Up Challenge program, which awards daily prizes.